The schedule varies drastically with the time of year (and is strongly geared to the ski lifts times in winter) so check the timetable – there’s generally one posted at every stop. There are two routes from Chamonix to Les Praz – one via Les Nants (the north-west side of the valley, buses pass through Les Praz village) and one via La Frasse (the south-east side, buses pass the MBC and the Arveyron hotel). Make sure you’re at the right stop for the service you are waiting for! They all stop at Flegere though, so getting from there into Chamonix is easy. All services stop at the Flegere lift. If the service is via Les Nants, it departs from Place du Mont Blanc. 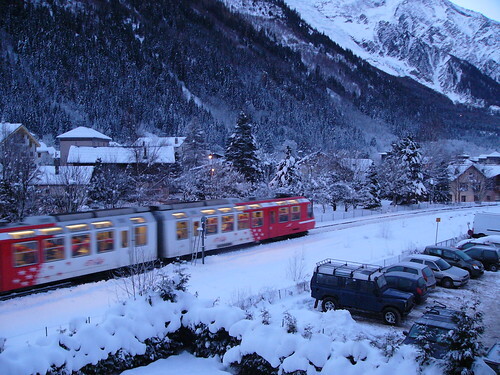 If it’s via La Frasse, it departs from the Montenvers train station. They take in both stops via a circuit of Chamonix before departing for Les Praz, where both lines stop at the Flegere lift. Early morning trainthis gite outline, by kind permission of Tatiana Mariassov. Les Praz has its own train station on the route of the Mont-Blanc Express and the trains are modern, new and comfortable with huge picture windows so you can admire the scenery. They have plenty of room for skis etc, and large areas for mountain bikes. It’s one of the nicest ways to get around the valley. They go at rather irregular times so check the Mont Blanc Express train timetable before you leave for the station, but are very reliable and almost always punctual. Travel between Servoz and Vallorcine is free with the lift pass or Carte d’Hote (which you will normally be given on arrival). If you don’t have either of these for any reason, or if you want to go further afield, you need to buy a ticket, which you can’t do at Les Praz as it’s not staffed – find the conductor and buy it on the train. Complete route with details of lifts etc along the way, from the timetable above. Very pretty map showing the Swiss side of the Mont Blanc Express (Les Praz isn’t marked on here for some reason) , and the St Bernard Express, from the rail company.